Do you have a question about a health condition of your pet or want to know more about pet nutrition? Ask Barkibu veterinarians and clarify your doubts. Click on "Ask free now!" Follow the steps and give the vets all the info about your pet: species, breed, age, name, symptoms, etc. In the box, describe in detail what the problem is. If you have, add pictures as extra info for vets. Enter your ZIP code*, we will use it to recommend you the best veterinarians near your location. Enter your personal data** (name and email), and if you want, a phone number. Remember! Be specific and you'll have more chances of getting an answer. If you need to, you can edit your question and add more info. *ZIP code is used to recommend you the best veterinarians near your location. 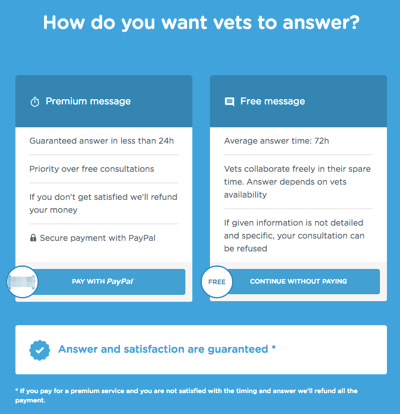 **Your personal data and phone number will be used to notify you when a vet answers your question.